ROMANIA’S CENTER GOVERNMENT FALLS, FASCISTS IN? On this date in 1937 Romania’s last free elections (until 1990) ended in the ouster of the middle-of-the road Na­tion­al Libe­ral govern­ment. The Libe­rals, who remained the largest party in parlia­ment, were unable to form a coali­tion govern­ment with the next two runner-up par­ties. A week later King Carol II named the leader of the far-right National Chris­tian Party—the anti-Semi­tic politi­cian, poet, and play­wright Octa­vian Goga—to head a new govern­ment, despite Goga’s party coming in fourth with 9.3 percent of the popular vote. Prime Minis­ter Goga imme­di­ately em­barked on a pro­gram to estab­lish a per­sonal dicta­tor­ship. Goga’s regime insti­tuted a para­military wing of fas­cist char­ac­ter, the Lancieri (Lance-bearers). The Lancieri borrowed heavily from a popu­lar ultra­nationalist, anti-com­munist, anti-Semi­tic com­peting group, the Iron Guard, also known as the Legion­naire move­ment (1930–1941), which Goga attempted to out­flank and which was also in­volved in vio­lence against Roma­nia’s 800,000 Jews who lived mostly in the north of the coun­try, where they formed the third largest community of Jews in Europe. The week before Goga proposed collecting all Jews and relo­cating them to an “unin­hab­ited” region, the further away the better, where they could found their own nation. Many of Goga’s coun­try­men felt the same way, for in that same year, 1938, anti-Jewish riots swept across Roma­nia. When Goga suffered a stroke and died in early May 1938, his body lay in state in Bucha­rest’s Palace Athe­naeum. Those mourning his passing in­cluded Ger­many’s head of state, Adolf Hitler, who sent a floral tri­bute to adorn Goga’s glass-top cas­ket. Within 2‑1/2 years Roma­nia was firmly in Hitler’s orbit. Of all his allies, Roma­nia was responsible for the deaths of more Jews than any country other than Germany itself. 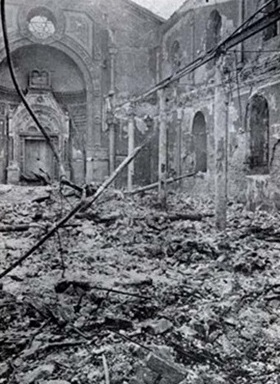 Left: Sephardic Temple in Bucharest after it was robbed and set on fire during a revolt of the para­mili­tary Iron Guard between Janu­ary 21 and 23, 1941. Prime Minis­ter Gen. Ion Anto­nescu had invited the Iron Guard, as a power­ful poli­tical, long-perse­cuted move­ment, to join his cabi­net the pre­vious Septem­ber even as he worked to curb their influ­ence. It was an un­easy alli­ance for that rea­son and because many Iron Guard followers were venge­ful toward any­one associated with the regime. On Janu­ary 21, 1941, the Iron Guard launched a rebel­lion (Legionary Rebel­lion) to over­throw Anto­nescu and seize con­trol of the coun­try. After three days of brutal street fighting, the Roma­nian Army was able to crush the putschists, but only after their rebel­lion had erupted into a vicious pogrom against Jews. Anto­nescu banned the Iron Cross movement and imprisoned 9,000 of its members. 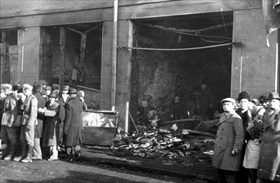 Left: Jewish stores destroyed, Bucharest, Romania, Janu­ary 23, 1941. For three and a half days, the capi­tal’s Jewish dis­tricts were at the mercy of mobs en­couraged by state media con­trolled by the Legion­naires. Even sol­diers were attacked. During this time several thou­sand Jews were dragged out of their homes and arrested on the streets or in syna­gogues where they had sought refuge. Among them were lay leaders of the Jewish com­munity, rabbis, person­nel from syna­gogues and Jewish com­munity offices, as well as Jewish jour­nalists, writers, doc­tors, and engi­neers. They were taken to pre­viously estab­lished desti­na­tions such as the Legionary Head­quarters, police pre­cincts, and even to desig­nated syna­gogues, where they were sub­jected to tor­ture or murder or both. Many were driven to the Jilava forest and shot. 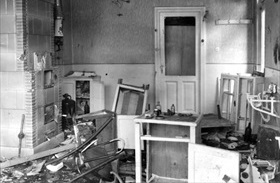 Right: A Jewish doctor’s office wrecked in the Bucharest pogrom, January 23, 1941. 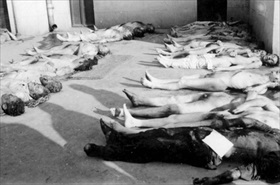 Left: Bodies of Jewish people are laid out at the Jewish Legal Insti­tute, Bucha­rest, Roma­nia. After the pogrom, by Janu­ary 27, 1941, workers of the Jewish com­munity offices had identified 121 of the dead; how­ever, 400 were still missing. In many instances, Legion­naires had mutil­ated the victims and stripped them of their clothes. Right: People wounded in the pogrom lie in a Bucha­rest street, Janu­ary 23, 1941. At dawn that day a truck from the Podsudeck sau­sage fac­tory was loaded with 15 Jews who had been held under police arrest. They were driven to the munici­pal slaughter­house at Baneasa and mur­dered with 100 other Jews who were cap­tive there. 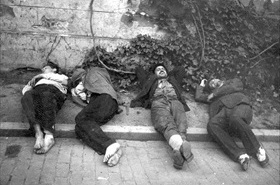 Some had the word “kosher” marked on their corpses. While this car­nage took place inside the slaughter­house, a large num­ber of Legion­naires were out­side singing and mocking Jewish psalms and prayers. 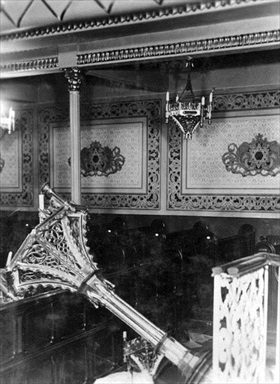 Another group of Jews was taken to a farm in Bucharest’s Straulesti district, where they were shot.